Whenever someone asks me what I love best about living in Paris, I find it hard to answer. 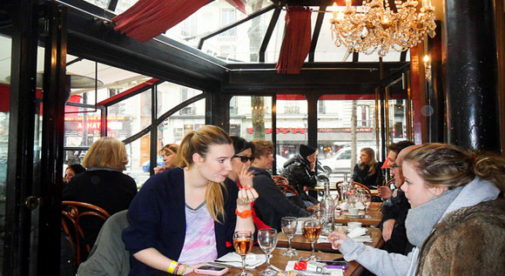 As you might imagine of the city of romance, living in Paris has countless charms. First, there’s the beauty. Even after being here for 12 years, I still have not grown blasé about the unabashed prettiness of Paris. My gaze still lingers on the beauty of the city’s stone buildings…the wrought-iron balconies with ubiquitous bright red geraniums…the romantic, twisty streets and wide tree-lined avenues…those lovely centuries-old bridges spanning the Seine. Now that it’s summertime, I’m preparing to enjoy one of the things I love most about Paris: its convenient location. Paris is a hop, skip and a jump to a seemingly limitless number of fascinating places, both within France and throughout Europe. A short flight—two hours or less—will put you in cities such as Berlin, Zurich, Lisbon, Rome, Vienna or even Warsaw. And thanks to bargain airlines, the cost can be quite reasonable. But even though traveling by air is faster to these places, I prefer road trips. In France, all roads lead to Paris…or exit from Paris, as the case may be. These major highways take you all over France and beyond, making it a snap to see the best of Europe at a leisurely pace. Each summer, my family and I drive from Paris to Tuscany, and it’s one of my favorite things in the world to do. We start by driving to France’s northern Burgundy region, just two hours south of Paris, where we spend a few days traipsing about its verdant hills and forests (not to mention drinking its legendary wine). Next we head south toward Lyon, about three hours from Burgundy. I always feel that the moment we arrive in this lovely city is the moment our vacation truly begins. Even though Lyon is still well north of the Mediterranean, the city has a decidedly Mediterranean feel, from the sunny pastel-colored buildings lining the Saone River to its unhurried atmosphere and large, graceful plazas. After a day or so in Lyon, we head deeper into France’s south. As we drive, the sky becomes a richer blue, the sun more brilliant, the countryside more heart-stoppingly picturesque, full of piled stone villages with brick-red cantilevered rooftops. The snow-capped Alps rise before us and it feels as if we’re driving straight into a postcard. But no, we’re just driving straight into Italy. We’ll spend a few days on the Italian Riviera—usually Santa Margherita, a spectacular but tranquil beach town. Then finally, we drive onward to Florence. Bliss. People sometimes ask us why we choose to drive to Italy each summer, when a flight would be much faster and easier. If it’s not already evident from the above, the journey is the destination for us. Driving across France is like savoring a delicious meal that you only get once a year. Why would we trade that for 90 minutes of being cramped in an airplane seat? Moreover, we do it because we can do it. Living in Paris offers so many more benefits than just Paris life. All of France and Western Europe is ours for the easy picking. And pick it, we do.